During the decade of the 1960s capitalist expansion abruptly provoked a cultural crisis, or, as they say today, a crisis of values. Society had involuntarily given rise to new vital needs and new social demands that clashed head on with the old norms and became flammable material contrary to everyone’s expectations. Economic development had entered into violent contradiction with ideological structures, creating an atmosphere of frustration that fostered a sense of uprootedness and dissatisfaction, dangerous sentiments when they are expressed outside of artistic and literary milieus, as the revolts of the sixties would demonstrate. The biggest and most fruitful of all of the revolts of the 1960s was that of May ’68. One of its most notable results was the very existence of a generation of young people that was so radically opposed to the consumer society, or more precisely, the society of the spectacle, that it could not be politically regimented, since it was looking beyond politics, because in its view all the parties were equally absurd and part of the system. A generation that did not seek its freedom and the meaning of its life in a modernized state or an updated version of an essentially unchanged society but rather in the destruction of all social conventions and institutions. A lost generation, for which Jaime Semprun was a brilliant exponent. The proletariat was beginning to manifest itself with historical force, so that the class struggle appeared in its most innovative aspects as action by means of which it recognized itself and considered its principal mission, which could only be the total subversion of the archaic society. The situationist critique, exposing everything about social and political life that was false and unsatisfying, and formulating the most daring and accurate aspirations underlying the struggles of the time, had a major impact on the enfants perdus of the era, fulfilling for many of them the function of Ariadne’s ball of thread, by means of which their restless spirits found the luminous road of the revolution amidst its uncertain beginnings, or, to put it another way, by becoming the instrument of mediation with reality thanks to which they came of age in a quite peculiar way. The Situationist International also provoked a zeal for imitation among many misfits that could only turn out badly, for once the battle of the barricades of May had taken place, the abstract repetition of one or another detail did not produce any results. Far from the terrain of real struggle, action invariably degenerated into either a limited adventurist activism, or else pretentious and defeatist passivity. Jaime would learn this firsthand in his first encounters and in his first collective experiences, not all of which were frustrating. In one of them he got to know the former situationist Eduardo Rothe, and Rothe later introduced him to Guy Debord, a personage who was then beginning to become a legend, and whose brief acquaintance marked his character and oriented the development of his thought even more than the experience of ’68. In the opinion of Debord, who sought to dissociate himself from old comrades like Vaneigem and Viénet, the dissolution of the S.I. was necessary in order to prevent its transformation into a mystifying vanguard. At that time, if one wanted to lend a hand to the revolution you not only had to respond to the question, “What is to be done?”, but also, “What is happening?” In his own inimitable way, Debord reversed the famous Thesis on Feuerbach.2 As he wrote to Eduardo in February 1974: “The principle work that, it appears to me, one must engage in—as the complementary contrary to The Society of the Spectacle, which described frozen alienation (and the negation that is implicit in it)—is the theory of historical action. One must advance strategic theory in its moment, which has come. At this stage and to speak schematically, the basic theoreticians to retrieve and develop are no longer Hegel, Marx and Lautreamont, but Thucydides, Machiavelli and Clausewitz.”3 The events that followed the collapse of the Caetano government in Portugal on April 25 of that same year unexpectedly provided him with the terrain on which the historical action he sought could be carried out. Portuguese capitalism wanted to modernize its operations but the modernization that it fought for was an archaism that failed everywhere, giving way to two parallel movements, that of the rapid formation of a political trade union bureaucracy and that of the autonomous self-affirmation of the proletariat. Debord could rely only on the most meager forces for his strategic operation: in Lisbon, Afonso Monteiro, who translated The Society of the Spectacle into Portuguese, and in Florence, Eduardo Rothe, whom he urged to go to Portugal. He pointed out to Afonso that “the exposition of a revolutionary perspective must still consist of describing and explaining what takes place day after day, and is never satisfied with the ridiculous, abstract proclamation of general goals”.4 He told Eduardo that “the first condition is obviously that ‘our party’ should constitute—or meet with?—an autonomous group in Lisbon with its own means of expression”.5 Should a real revolution take place he would go there himself even though he could not speak Portuguese, and would also call upon his friends, and certainly others as well. The news reports were encouraging and the whole situation could very well have taken a truly revolutionary turn. It was no May ’68, but it was moving in that direction. In Lisbon the group created by Afonso and Eduardo formed a “Conselho para o desenvolvimento de revoluçao social” [Council for the development of the social revolution] and posted an “Aviso” [Notice], like the one that was posted in Milan, throughout the city.6 By the end of August, however, the revolutionary process began to lose steam, because the multiple focal points of the revolution were never united, while their enemies—the social democracy, the military leadership and the Stalinists—were busy fortifying their positions. The worst thing about the whole affair was that his friends, after the first few months, even with the reinforcement of the former situationist Patrick Cheval, did not appear to be capable of measuring up to the challenges posed by the situation, allowing the major occasion of the workers demonstration of September to pass without any action on their part. The reports received from the demonstration of February 1975 called by the Inter-enterprise Committee were still encouraging, however. “It is clear that the modern proletariat has never gone as far as this, not even in Hungary, where foreign factors distorted the game”, he wrote to Afonso Monteiro, urging him “to show the profound meaning of this autonomous organization, the very logic of its action and to put it on guard against all those who would fight against it.”7 The information he received after successive visits by Antonia Monteiro (Afonso’s girlfriend) and Eduardo led him to conclude that a revolution was really taking place in Portugal despite the efforts of the international press to conceal it, and that it would probably be defeated, in view of the reconstruction of state power and the efforts of all the world’s exploiters to stop it. At the current stage, the advanced groups, with hardly any means at their disposal, could not do much, if they had not yet been able to accomplish anything, because the final showdown would take place on a much larger stage. But Debord thought there was still something that could be done to delay the likely defeat: “The revolutionary situation in Portugal is almost totally unknown in all the milieus—even the extremist ones—in all countries. Whatever happens, it will be important to publish the maximum of the truth in countries other than Portugal.”8 It was at this moment that Jaime entered the picture. Eduardo had written a manuscript about the modern revolution, but it possessed the defect of not having much to say about Portugal. It was necessary to rewrite it and incorporate some relevant anecdotes, but his material and emotional situation, which had always been unstable, deprived him of the tranquility that is necessary for carrying out such an urgent task. And to make things worse, Debord broke off relations with him for personal reasons, which were later embellished with vague accusations of “lies”, “set-ups”, “misery” and “incompetence”. Despite having made a commitment to write the book, Eduardo returned to Lisbon only to depart immediately for Venezuela. Jaime, having walked into the middle of difficult situation and not knowing anything about Portugal except some fragmentary verbal accounts and the articles from Le Monde that Debord had discussed with him, had to confront his first important challenge: he had less than a month to write the book that would reveal the Portuguese revolution to the world. He masterfully fulfilled the task assigned to him, finishing the book at the end of April. Gérard Lebovici, the owner of Champ Libre, was diligent: on May 16 The Social War in Portugal9 was in the bookstores. For Debord, the book was magnificent and was “the first time that one can read such a book before the failure of a revolution”.10 It was of extreme importance to publish a Spanish language edition, since, being the neighbor of Portugal, Spain could very well be susceptible to the Portuguese contagion. In both countries the workers movement constituted the only barrier to the parliamentary modernization supported by the Stalinists. In Portugal, the workers of the autonomously coordinated factory assemblies had taken to the streets on June 17 and July 4 in Lisbon, and on July 19 in Porto, refusing to support either the Stalinists or the socialists. “Obviously, one must especially evoke this strength in the postscripts to foreign editions”, Debord suggested.11 As it turned out, Jaime somehow managed to get Ruedo Ibérico, in Paris, and Tusquets, in Barcelona, interested in The Social War. The Catalonian publisher assumed responsibility for the translation but the Spanish censorship prevented the book from being published in Spain. Finally the book, with its corresponding afterword, was published in August in Paris by an ephemeral operation directed by the future journalist for Cambio 16, Xavier Domingo, El Viejo Topo, which up until then had been part of Ruedo Ibérico. German and Greek editions were also published in 1975. Paradoxically, the Portuguese edition was not published until a year later, in 1976. Everything seemed to be going perfectly; Debord was pleased with the success of the book, and in the meantime he had come up with the idea of another book, directed against the French ideology, Précis de récuperation. He even fixed up a room in his house in the country for Jaime and his girlfriend Anne. The couple’s summer visit did not measure up to the Debordist expectations and they departed under less than amicable circumstances. In response to a subsequent request for a meeting, Debord alleged, through his wife Alice, that he was too busy. Afterwards, nothing. No response to his sending a copy of Précis. Jaime was perplexed and asked himself what could account for the final renunciation of what had been such warm and friendly relations, which is why he sent Debord a letter (dated February 6, 1976) that earned him a murky response: “I willingly admit that all this is mostly a matter of personal taste. Here, as in the use of life and the preferences among those whom one encounters in it, it is certainly not a matter of expounding upon and supporting one's own tastes, but in the perfectly vain goal of rallying to them those people who have different tastes”.12 Jaime was just as confused as he was before. He had wanted Debord to specify just what changes had taken place with regard to these tastes and preferences, which had been so similar only a short time before. But understanding that explanations would not change the basic fact of his estrangement, he did not persist. It takes two to tango. Months later he would discover the real reason. Debord confessed that “I have had the impression that our relations took a bad turn after the evening I brought you to a dinner[-party] of young workers, almost all of them unemployed. I was surprised by the great severity of your judgment of those people, which you issued on the way out of their place, especially given the fact that, according to your own accounts and conclusions, so many sad pro-situs have successively surrounded you that you now occasionally need some time to see right through them and reject them…. I certainly do not want to exaggerate the meaning of this quite harmless incident, but it is a fact that, afterwards, there was no longer the same sympathy between us….”13 It was a personality conflict. An open and straightforward temperament like Jaime’s had become entangled with a quarrelsome and devious temperament like Debord’s through a trivial discussion to which the former did not concede any importance while the latter was inclined to extrapolation. Jaime was free to act on his own account, but as far as Debord’s friends were concerned he was persona non grata. It would not take long to put this to the test. While the revolution in Portugal was being smothered, the process that had given rise to it showed strong signs of life in Italy and Spain. It was precisely the subsequent repression that led me to go into exile in Paris in May 1975. In September I ran across The Social War in Portugal in a libertarian bookstore and while reading it I discovered keys to understanding the Spanish process. Then I wrote a letter to Champ Libre with the intention of contacting the author. Jaime responded in the affirmative by mail, inviting me to a dinner party at his home on the Rue de Trevise. We talked about everything. Jaime was quite familiar with the Spanish Civil War, having worked between 1970 and 1971 on the preparation and even some of the writing of the book by his uncle Carlos Semprún-Maura, Revolution and Counterrevolution in Catalonia, which had just been published in Catalan. Many pages reveal his style, agile and cutting, contrasted with that of the author, which is somewhat stodgy and pedagogical. The Précis was published in January 1976. A little while later we finally agreed to collaborate on writing a text in Spanish that would relate the Spanish events with the tense situation in Europe after the Portuguese revolution, the strategy of tension in Italy and the fall of the colonels’ regime in Greece. He contributed the strategic analysis derived from his Portuguese apprenticeship, and I contributed the concrete knowledge of the assembly-based strike movements in Spain. From this collaboration a pamphlet emerged for “internal” distribution to militants, with the Clausewitzian title, “The Spanish Campaign of the European Revolution”. We addressed the combative workers under the name of “Internationals of the Spanish Region”, in accordance with the nomenclature used in the First International in the early days of the workers movement, and we signed the text with the name, “Los Incontrolados”, laying claim to the shameful slur that the coalition of the republican bourgeoisie and the political and trade union bureaucracy of 1936 hurled at the revolutionary proletariat. The pamphlet was not widely distributed because we had few contacts and a large number of copies had fallen into the hands of the civil guards at a border checkpoint. A parallel project would emerge in the form of a book that was intended to tell the story of the Spanish revolution from the perspective of its most radical protagonist, the founder of “The Friends of Durruti Group”, Jaime Balius, who was living at the time in a nursing home in Hyères. I wrote a letter to Balius encouraging him to write down some memoires, but he was prostrate in a wheelchair and it was hard for him to write, besides the fact that he did not have any documents at all. The project appeared to have been postponed, but not canceled.14 In the meantime, the Spanish workers movement had entered an autonomous phase, and no trade union or political barrier existed that could stop it. The modernization of Francoist Spain could not afford the luxury of allowing “soviets” to spread throughout the country, which is why its highest leadership circles issued the order to the police to open fire on the demonstrators. March 3, 1976 marked the turning point of the process. From then on the workers had to either coordinate their actions against the state power on a national scale, sweeping aside all the obstacles that stood in their way, or else wait for those obstacles to come to them, entrenching themselves in the most combative centers of resistance. To go on the offensive or to stand fast for a defensive struggle. We considered calling attention to this choice that was presented on the peninsula by publishing a book. Fortunately, in May, a voluminous dossier came into our possession containing pamphlets and documents pertaining to the Vitorian workers that provided us with first-hand information.15 Jaime, who had some experience with regard to the issue, set to work and in October we had a presentable text that we entitled, inspired by Potocki, “Manuscript Found in Vitoria”. A meeting was scheduled with the publisher Lebovici to offer the manuscript for publication but the discussion broke up due to objections raised by Lebovici. Jaime took them literally, that is, as suggestions for improving the text, without grasping the refusal to publish the book that was the implicit message of Lebovici’s objections. So when he confidently re-wrote the text in accordance with Lebovici’s pretexts and offered it to Lebovici again in December, on that occasion he met with an unambiguous rejection. Once again he was guilty of being ingenuous and almost innocent when faced with standard procedure among publishers, which consists in not saying yes rather than saying no. Jaime had not undergone this kind of treatment on two previous occasions, when The Social War and Précis were published; something or someone had to be responsible for this rejection. The logical conclusion was therefore to think that the person who was directly or indirectly responsible for Lebovici’s change of heart was Debord himself, but if he knew it was true that the latter was no longer his friend it was doubly ingenuous to ask him the question: “Must I now understand that I have to count you among my enemies?”16 Jaime’s failure to grasp the obvious allowed Debord to affect a blameless innocence and Lebovici to claim that his decision was based on his own personal opinions and that there was no outside influence involved. In fact, Debord had received a photocopy of the manuscript without any acknowledgement on his part to the sender, the publisher Lebovici, which according to his way of seeing things proved that he had nothing to do with Lebovici’s rejection of the manuscript. He nonetheless confessed that he did not find the Manuscript excellent: “It isn't a question of a basic political disagreement. I approve of the revolutionary intentions of the Spanish proletariat and the authors who approve of it. But this does not immediately give it a sufficient reason to be published as a book.” In his view the text did not provide a coherent explanation of what was happening in Spain, a very debatable assertion if not accompanied by examples of the incoherence of the text. Debord added that in his opinion, it was “much more revolutionary, and much more interesting, than those that Champ Libre has published on Ireland and Italy, to say nothing of the horrors written about Germany”,17 but ultimately, if Lebovici thought that it was not as good as the two previous books (The Social War and Précis), he did the right thing by not publishing it. During this period Debord was much more absorbed in the events in Italy, having translated The True Report,18 which, by the way, Lebovici had presented to Jaime as a model of what he should do in Spain. While it is true that Debord was an avid reader of Gracián and Jorge Manrique, he did not know much about Spain and even less about its dangerous classes; nor did he have a solid grasp of what was being concocted between the Francoist apparatus and the Stalinist “democratic” opposition apart from what was published in the newspapers, nor did he have any idea of the difficulties that were posed for the transitional reforms by a workers movement that was too independent of the bureaucracies. The visit to Spain he made with Pierre Lepetit took place too soon, before the events of the late seventies, and his subsequent trips to Spain were too late, in hindsight, and he did not exactly distinguish himself for his lucidity in his campaign on behalf of the prisoners of Segovia.19 Even so, his ignorance did not prevent him from “acquiescing” in Lebovici’s rejection of the book. Jaime understood that he had put himself in a bad position by accusing Debord of a hostile attitude that was depicted in Debord’s letters as a simple difference of opinion or a frivolous question of taste, and he bade farewell to Debord with a kind of self-critique, such was the respect that inspired him, as one who momentarily came upon the world revolution only to leave it afterwards like someone who departs from a feast, or such was his generosity for a failed friendship. And I have to say that his relations with Debord, which were at times tempestuous, at other times tranquil, did not end there. The rejection from Champ Libre did not discourage him, but we were letting the time pass, while the transmutation of the Francoist dictatorship into European-style parliamentarism was assiduously pursued with major results. 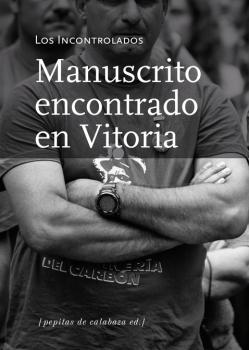 Although I was ready to return from exile to see what could be done on the peninsula, Jaime did not have enough connections to get the Manuscript published by a decent publisher, so we decided to reduce its length and publish it as a pamphlet, just like “The Spanish Campaign”, but this time in Spain. I eliminated the quotations from “The Spanish Campaign”, divided the text into two parts, introducing the second part with a quote from The Friends of Durruti, translated it and made some last-minute changes by adding just a few lines to connect certain passages. The signature would be the same, “Los Incontrolados”. On the back cover I placed the “blurb” from “The Spanish Campaign” along with the text, “What There Is To Know about Los Incontrolados”. Jaime gave it the finishing touch after he discovered in the National Library the original quotation from Donoso Cortés with which the pamphlet begins, a detail that had obsessed him. In explanation for his meticulousness he said: “Nothing is good enough for the proletariat.” When I returned from Barcelona, without a penny to my name, I had no problems finding a copy shop that would publish it. This was in May 1977. With a borrowed car, I undertook a tour of various major cities accompanied by three colleagues, and together we dropped off copies of the pamphlet at all the bookstores that would take them. We cannot say that the Manuscript was a big success, but it did not go unnoticed, either. In December it was retranslated into French and published in Toulouse, which led Jaime to publish the original version in the journal edited by Roger Langlais and Bernard Pêcheur, L’Assommoir, in the same issue that featured his defense of the Portuguese workers revolution against the “demoralizing syllogisms” of the ultra-left.20 In 1979 another translation appeared in England, published by the Wise brothers. A third pamphlet by Los Incontrolados would be published in 1981,21 but the extinction of the autonomous workers movement and the disappearance from the radical scene of the assemblies inhibited theoretical debate and buried the memory of the class struggles of those days under tons of official history disseminated by the media. The resumption of social struggles, however, revived interest in the Manuscript, which has been photocopied many times, republished twice22 and was also subject to the treatment that is inevitable these days: it has been uploaded on the Internet. For the present edition, in which a couple of errors have been corrected, we want to introduce the reader to the atmosphere of the era when it was written, focusing on the early adventures of the author of the Manuscript, who was to spend so many more years as a revolutionary and who was to make so many important theoretical contributions, and who died in August 2010, leaving behind an indelible memory in all those who are proud to have been his collaborators and friends. Translated in March 2014 from a copy of the Spanish original provided by the author. 1. Published as the Preface to the 2014 critical edition of Los Incontrolados, Manuscrito encontrado en Vitoria (“Manuscript Found in Vitoria”), Pepitas de Calabaza, Logroño, 2014. 5. Letter to Eduardo Rothe, May 8, 1974, Correspondance, Volume 5. 6. “Aviso a os proletarios portugueses sobre a posibilidade da revoluçao social”, dated May 24, 1974. The Milan text of the Italian section of the S.I. of November 19, 1969, which was co-written by Eduardo Rothe, bore nearly the same title: “Notice to the Italian proletariat concerning the real possibilities for a social revolution”, and the contents, except for the different locations and social contexts, was essentially the same. 9. An English translation of The Social War in Portugal is available online (in March 2014) at: http://www.notbored.org/social-war.html [American Translator’s Note]. 14. In June 2003 the Barcelona publisher Virus published La Revolución Traicionada. La verdadera historia de Balius y Los Amigos de Durruti [The Revolution Betrayed: The True History of Balius and The Friends of Durruti]. 15. “Informe Vitoria, enero-abril 1976” [Vitoria Report, January-April 1976], Grupo de trabajo Alternativa, self-published, May 1976. In the autumn of the same year Ruedo Ibérico published “Vitoria-Gasteiz: de la huelga a la matanza” [Vitoria-Gasteiz: From Strike to Massacre]. 16. Jaime Semprun to Guy Debord, December 17, 1976, Editions Champ Libre, Correspondance, Vol. 1. 18. Rapporto Veridico sulle ultime opportunità di salvare il capitalismo in Italia, published in Milan in 1975 and signed by “Censor”, the alleged pseudonym of an enlightened conservative or a cynical reactionary, or even a camouflaged left wing politician. The report, which was actually written by the former situationist Gianfranco Sanguinetti, recommended state terrorism framed within a strategy of tension as the only way to save capitalism. 19. Debord’s tour of the Castilian region took place around 1969, and he visited Seville in 1983. In the 1980-81 campaign for the release the prisoners, he situated them, who constituted a marginal and mixed phenomenon, at the heart of the social question in Spain, even after the Moncloa Pacts and the liquidation of the assemblies authorized by the (Anti-) Labor Statute. Most of the prisoners were released from the Segovia prison in exchange for a promise to renounce the armed struggle that was brokered by a socialist senator, rather than by the songs written by Debord so that they would be sung by the revolutionary workers (sic). 20. L’Assommoir, no. 3, Paris, 1979. In this same issue a mysterious “Encyclopédie des Nuisances” was announced. 21. “Revelaciones sobre el proceso de descomposición del Estado español y sobre los métodos aplicados para remediarlo” [Revelations concerning the Process of Decomposition Affecting the Spanish State and the Methods Implemented to Counteract It]. The pamphlet analyzed the so-called “Transition” that had culminated with the Tejero coup attempt. 22. By Literatura Gris in November 1999, and by Klinamen/Biblioteca Social Hermanos Quero in November 2004. Eduardo Rothe went from situationism to Chavism.